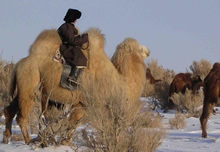 A severe summer drought, followed by winter temperatures of minus 40-50°C, has resulted in the loss of an estimated 8 million animals – about 17 per cent of Mongolia’s livestock. The extreme conditions, known as dzud, have had a devastating impact in a country where 40 per cent of the population depend on livestock. In northern Kenya, pastoralists have also recently experienced one of the worst droughts in decades – the fourth severe drought in the last ten years.